I know every family runs dinner time differently in their household, but around here I like to have every day planned out ahead of time. I’m terrible at doing laundry, you will never find me scrubbing anything, I don’t think I’ve ever emptied a trash can and our bed is only made when I know people are coming over. Crafty? Sure! Domestic? Not even close. But I will make an exception when it comes to dinner…it’s always planned, and always ready by the time Greg gets home from work. I don’t think he has any expectations for my day besides making sure our kids survive so I know he really appreciates this after he has had a long day. Twelve hours of our day are spent on completely different wave lengths, and when our worlds collide at 6:00pm, sitting down to dinner as a family is the best way for us to get back on the same page. We may only get 10 minutes to actually eat our food, and sometimes dinner is spent standing around our kitchen island but we know this routine will get easier and easier as the boys get older. It’s important to us, so we try our best. Since changing to eating primarily clean meals, I’ve also found that planning ahead makes all the difference. I used to buy a lot of premade foods from Trader Joes to make preparing dinner easier. Frozen meatballs, premade stuffed peppers, frozen turkey meatloaf, etc. At the time I thought we were eating fairly healthy (I mean isn’t everything from TJ’s healthy? ), and I loved being able to throw these items together last minute with some side dishes, but now I know that dinner can be just as quick without taking the less healthy short-cuts. The best part is Greg hasn’t noticed any difference in the taste and portion department, but he has noticed a difference in how his clothes are fitting him. Since the new year he has lost almost 30 lbs on our diet changes alone!!! It’s truly shocking to both of us that this lifestyle change has made such a huge difference to our bodies without actually feeling like we have changed anything at all. I’m not going to lie we have cut back on alcohol. WAYYYYYY back! I think I can count on 1 hand how many times we have had drinks the past 4 months in comparison to having wine/beer a few nights a week to unwind. I’m sure as the warm weather approaches we will find ourselves outside with a drink in our hands, but for now this hasn’t been a difficult change to make. There are so many awesome resources out there now for clean eating recipes, but like any creature of habit, I have found our favorites and just rotate them throughout the weeks. I’d love to know what some of your favorite “go-to” meals are during the week. Do you meal plan? If so, what’s on this week’s lineup? I try to do one new recipe a week and will add it to the rotation if it ends up being a hit. I’d love to hear new ideas! I just realized it’s not very nice to talk about all this food without sharing a recipe too. I made a new quinoa salad last week that was great! I suggest making a large portion of it…I was able to stretch mine out for a dinner meal for the family and then had enough for lunch the next 2 days. Hope you enjoy! To prepare: Whisk together the EVOO, lemon juice and vinegar and set aside as dressing. Prepare the quinoa as stated on the package. While quinoa is cooking prepare/cut the above listed vegetables and throw into a large mixing bowl. 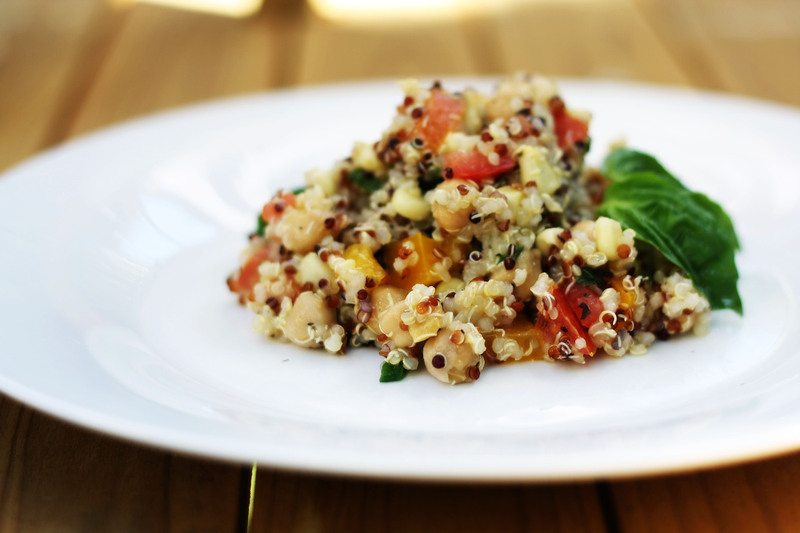 Once quinoa has slightly cooled add to the cut veggies and toss together with dressing. Enjoy right away or keep refrigerated until ready to serve. Sounds delic, Lauren. Hummus crusted chicken? Recipe please! Love this! I really want to be even better at eating clean. So hard when you are working and taking class and training, etc. I find I barely have time for all of that, let alone meal preps, etc. You are so right, though: I NEED to plan ahead when it comes to meals. On the weeks that I don’t end up planning ahead, it is pure chaos. Your TJ comments really hit home for me. I am definitely stuck right there. Lots to get inspired about and clean eating is definitely right up there on the list! Thanks for continuing to pique my interest! Anytime D!! It was kind of intimidating at first, and I felt like all I was making was grilled chicken and veggies (booooring) but after some time I’ve found there is so much variety and it actually makes grocery shopping/cooking easier. Maybe try to make 2 clean recipes a week to start and see what you think. Check out http://www.thegraciouspantry.com. Lots of great recipes! Lauren…. I am so impressed and looking forward to eating clean when I visit in May!!! I could definitely take some lessons from you!! Looks like I won’t be cooking much when I’m there! Lol. Do I still get to visit 99 Ranch? :). Sure!!! I love that place! And you know what? They have an awesome produce section so I’m sure we can still get lots of fun stuff. Just catching up and UM Meal Plan Monday – amazing and genius!!! Are you ok if I start this too? Your meals look amazingggg! There is no way I came up with Meal Plan Mondays on my own soooo obviously you can join in too! I would love to see some of your awesome recipes you do throughout the week!